Every Saturday for the last few months, I’ve been visiting Nenek Faridah and her grandchildren. I was introduced to them through a friend as part of a local befriender programme. As someone interested in recording personal histories, I spent some time during each visit learning more about Nenek Faridah’s life. 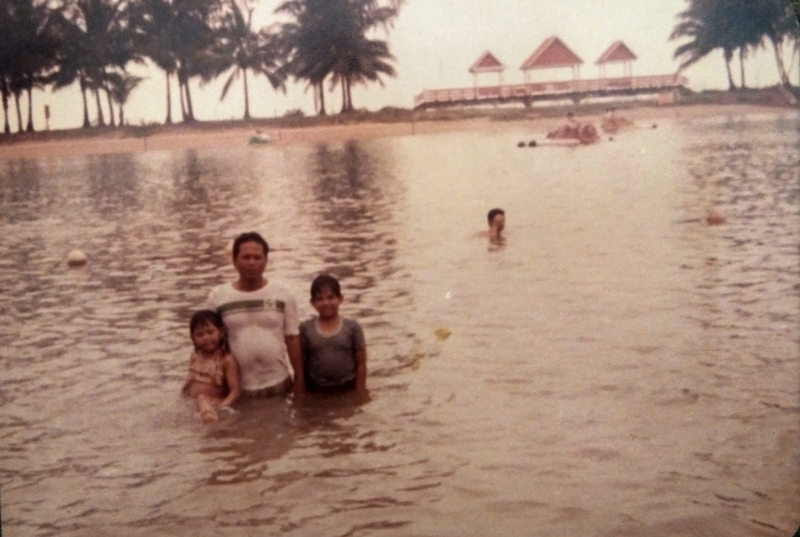 Nenek Faridah's husband and children at Pulau Balakang Mati (Sentosa) in the 1980s. She grew up on Pulau Brani from the late 1950s to mid-70s at a time when many British and Malay families lived there. Pulau Brani is an island between Sentosa and the main island of Singapore that means "Island of the Brave" in Malay or "Home of the Warriors". It was historically a Malay fishing village that became home to the British Army’s maritime base and the Straits Trading Company’s tin smelting plant where Faridah's father worked. Her family, like many others, lived in the married quarters on the island and she went to school there. Faridah remembers that classes were all taught in Malay by Malay teachers for Malay students. On a family holiday to Malaysia in the 1980s. Faridah liked to explore and the island was freedom for her. She would go swimming with her friends whenever she wanted and they could catch fish in the river if they were hungry. The only things they had to be wary of were snakes, bears, and ghosts. As a young girl, she remembers that the ghosts of dead Japanese soldiers lingered on the island - you could feel them in the wind. When it rained at night and Faridah was on her father’s boat, they would often hear strange howling sounds that scared her. On one of her adventures with a friend, she came across seven forts with cannons facing the sea. Finding an old grenade on the ground, her friend playfully picked it up and threw it. To their surprise, some debris boomeranged back and cut her friend’s face. They were convinced that it was the ghosts of old soldiers. Faridah’s mother lived through World War II and would tell stories about how afraid everyone was of the Japanese because they would break into people’s homes looking for pretty girls, especially Chinese girls. If a girl wore makeup, she would definitely become a target. Faridah’s mother told her that Malay women used to put black stuff on their faces and cut their hair short to look unattractive to the Japanese. 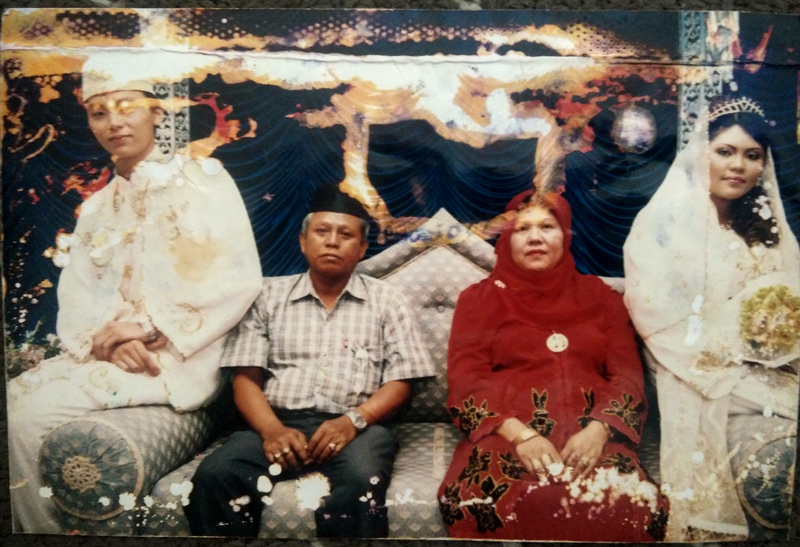 Faridah and Yamal on Pulau Pinang (Penang Island) in the early 1990s. Faridah spent about a month getting to know Mohammed Yamal. They were both nervous and spoke briefly a few times. During one of their meetings, he gathered up the nerve to touch her shoulder. It annoyed her and she defiantly jerked herself away giving him the how-dare-you look. She was and would be the boss. After that month, she consented to marry him. She was 17 and he was 23 when they got married. Though they didn’t know each other very well in the beginning, they grew to love each other deeply. On a trip to Johor Bahur in the 2000s. Their love was in the little things. When they first got married, Faridah worked at a factory in the packaging department. Before she would leave for work, he would make sure she had money and sometimes pack her food. They developed a playful routine. She would pretend to be upset with him and he would come ‘sayang’ her. Yamal in his younger days. This shot was taken when his friends were playing a prank on him. Yamal was very friendly and had a lot of friends. He was also a good judge of character and he listened to his wife. Faridah saw a pattern of too many husbands hanging out at the coffee shop with their friends instead of being home with their families. She told Yamal not to go to the coffee shop so much. If he wanted to hang out with his friends, he could invite them over and she could make everything the coffee shop could offer. So he would come home after work and they were very happy together. Family time in Bukit Panjang. The first home Faridah and Yamal had was in Jurong. They raised their first two daughters there. Once, when Faridah was out of the house, her daughters were playing with matches set the house on fire. It was quite serious, but thankfully no one was hurt. Everyone from the police to the fire department to HDB and even JTC came to help or access the damage. After that, they moved to Marsling and then to Bukit Panjang. Kuala Lumpur in the 1990s! Faridah is in yellow. In Bukit Panjang, they had two flats. One for them and the other for their children and their families. Times were good. They family was happy, which meant that Faridah was happy. They used to make trips to Malaysia, visiting Gelang Patah in Johor Bahru, Pulau Pinang (Penang Island) and Kuala Lumpur. One of Faridah's daughter's wedding. Things began to change after they moved to Sembawang. Their youngest daughter’s husband was sent to prison. Faridah’s daughter left her four children in Faridah and Yamal’s care and left. The stress of it all was too much causing Yamal’s poor health declined further. Yamal passed away in September 2015. “When I think about him it makes me happy, then it makes me cry,” she said. Faridah’s broken heart affected her health. After Yamal’s funeral, she came down with several illnesses that have prevented her from going back to work. In the blink of an eye, she became a single grandmother looking after four young children and her daily grief was hard to bare. From Sembawang her family moved to Yishun and this is where I met them. These days she is getting used to being a mother to her grandchildren, but the heartache of losing Yamal still lingers. I really enjoy spending time with Nenek Faridah and her family. Despite her circumstances, she is an anchor for her family and a pillar of support to her grandchildren. She continues to live wholeheartedly and for that, she has my deepest admiration.